Sometimes an earthquake has foreshocks. These are smaller earthquakes that happen in the same place as the larger earthquake that follows. Scientists can’t tell that an earthquake is a foreshock until the larger earthquake happens. The largest, main earthquake is called the mainshock. Mainshocks always have aftershocks that follow. These are smaller earthquakes that occur afterwards in the same place as the mainshock. Depending on the size of the mainshock, aftershocks can continue for weeks, months, and even years after the mainshock! What causes earthquakes and where do they happen? The earth has four major layers: the inner core, outer core, mantle and crust. (figure 2) The crust and the top of the mantle make up a thin skin on the surface of our planet. But this skin is not all in one piece – it is made up of many pieces like a puzzle covering the surface of the earth. (figure 3) Not only that, but these puzzle pieces keep slowly moving around, sliding past one another and bumping into each other. We call these puzzle pieces tectonic plates, and the edges of the plates are called the plate boundaries. The plate boundaries are made up of many faults, and most of the earthquakes around the world occur on these faults. Since the edges of the plates are rough, they get stuck while the rest of the plate keeps moving. Finally, when the plate has moved far enough, the edges unstick on one of the faults and there is an earthquake. Why does the earth shake when there is an earthquake? Earthquakes are recorded by instruments called seismographs. The recording they make is called a seismogram. (figure 4) The seismograph has a base that sets firmly in the ground, and a heavy weight that hangs free. 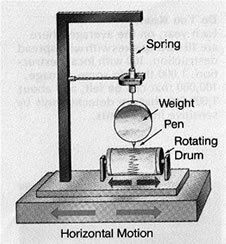 When an earthquake causes the ground to shake, the base of the seismograph shakes too, but the hanging weight does not. Instead the spring or string that it is hanging from absorbs all the movement. The difference in position between the shaking part of the seismograph and the motionless part is what is recorded. How do scientists measure the size of earthquakes? The size of an earthquake depends on the size of the fault and the amount of slip on the fault, but that’s not something scientists can simply measure with a measuring tape since faults are many kilometers deep beneath the earth’s surface. So how do they measure an earthquake? They use the seismogram recordings made on the seismographs at the surface of the earth to determine how large the earthquake was (figure 5). A short wiggly line that doesn’t wiggle very much means a small earthquake, and a long wiggly line that wiggles a lot means a large earthquake. The length of the wiggle depends on the size of the fault, and the size of the wiggle depends on the amount of slip. The size of the earthquake is called its magnitude. There is one magnitude for each earthquake. Scientists also talk about the intensity of shaking from an earthquake, and this varies depending on where you are during the earthquake. How can scientists tell where the earthquake happened? Seismograms come in handy for locating earthquakes too, and being able to see the P wave and the S wave is important. You learned how P & S waves each shake the ground in different ways as they travel through it. P waves are also faster than S waves, and this fact is what allows us to tell where an earthquake was. To understand how this works, let’s compare P and S waves to lightning and thunder. Light travels faster than sound, so during a thunderstorm you will first see the lightning and then you will hear the thunder. If you are close to the lightning, the thunder will boom right after the lightning, but if you are far away from the lightning, you can count several seconds before you hear the thunder. The further you are from the storm, the longer it will take between the lightning and the thunder. P waves are like the lightning, and S waves are like the thunder. The P waves travel faster and shake the ground where you are first. Then the S waves follow and shake the ground also. If you are close to the earthquake, the P and S wave will come one right after the other, but if you are far away, there will be more time between the two. By looking at the amount of time between the P and S wave on a seismogram recorded on a seismograph, scientists can tell how far away the earthquake was from that location. However, they can’t tell in what direction from the seismograph the earthquake was, only how far away it was. If they draw a circle on a map around the station where the radius of the circle is the determined distance to the earthquake, they know the earthquake lies somewhere on the circle. But where? Scientists then use a method called triangulation to determine exactly where the earthquake was (figure 6). It is called triangulation because a triangle has three sides, and it takes three seismographs to locate an earthquake. If you draw a circle on a map around three different seismographs where the radius of each is the distance from that station to the earthquake, the intersection of those three circles is the epicenter! Is there such a thing as earthquake weather? Can some animals or people tell when an earthquake is about to hit? These are two questions that do not yet have definite answers. If weather does affect earthquake occurrence, or if some animals or people can tell when an earthquake is coming, we do not yet understand how it works.